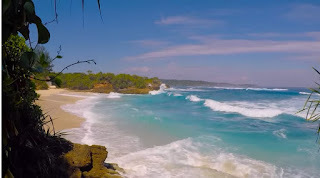 Dream Beach is indeed so beautiful with clean white sand at Nusa Lembongan and like there is no defect in the slightest wrapping with sky blue sea water, with high cliff walls, like a beach wall. By going down the stairs not so much, tourists can play water and sand while bathing on this beach. But the waves here are pretty big, so always be careful. This beach is also a haven for local and foreign tourists who have white sand and sea water that looks blue, and the waves are suitable for surfing right under the cliff. You have to go down the stairs to reach the shoreline of Dream Beach. Another gorgeous cross the ocean.